Dunkirk is a great cinematographic film. The impact of the actual historical event at Dunkirk is finely produced and theatrically impactful. Nolan took Dunkirk to a new level, emphasizing the actions of many over the actions of a few. Well played, Director Nolan, well played. There is a plethora of movies about World War II, Wonder Woman, Saving Private Ryan, Schindler's List, The Pianist, Pearl Harbor- just to name a few. We are obsessed with the superheroes, the love story, the underdog, and the victims of that time period. We immerse ourselves in the romanticization of the drama and stories that are derived from this horrible Second World War. The movies keep being made about this time frame, but always a similar theme- soldiers desperation, love, fighting, survival, and winning. Dunkirk brings us a different perspective- one in which we are forced to see that sometimes there is no hope for the soldiers, no way out, a desperation that is not so much a theme in other World War II movies. Dunkirk explores the 1940 trap that the English and French troops fell into. Germany advancing in France, forced the Allied troops to evacuate into one solitary place- the beaches of Dunkirk. Surrounded by sand and water, and out in the open, the Allied Forces were exposed and an inevitable target for the Germans. Dunkirk brings together a unique and almost untold story of the land, the sea, and the air, working together to save the Allied troops. The movie opens quietly. It is the foreshadowing of the calm before the storm that is gripping. A brief gunfire battle shows a band of brothers gunned down- all except one. He escapes to the beach, where you see organized troops –in lines- clearly waiting for ships to come and rescue them- ships that are nowhere to be seen on the horizon. The foreshadowing continues as you focus on one ship collecting the injured with many men standing on a long pier. The inevitability that said pier will be hit immediately enters your mind and doesn't leave until the movie has ended. Civilian boats are commandeered from England to sail the Channel to transport the troops, but as they sail, they too, are caught between safety and battle. Several lone fighter jets engage in battle over the seas by Dunkirk, right over the troops that are standing helpless- unable to save themselves- dependent on the birds in the sky- unable to reach the civilian boats- because the battle is between these brave men and the civilian boats that did not hesitate to come and save their soldiers. While the film is mostly devoid of dialogue, Harry Styles (band member of One Direction) and Tom Hardy (Inception) are incredible. Styles plays a young soldier determined to survive, although his entrance into the film portrays a very harrowing experience. Hardy plays a pilot, engaged in the survival of the Allied forces, as well as his own life. Both men's acting is dependent on their emotions, their facial expressions, as well as their movements. Hardy had the most difficult job, as his acting is almost limited to the cockpit of the plane, until the finale. The 4K Ultra HD is presented in 2160p with an aspect ratio of 2.2:1. The film is actually shot with two different cameras and provides a unique cinematographic perspective. The experience of watching the ground cameras film the troops on the beach in contrast with the fighter jets in the air is exceptional. The detail in the 4K color scheme is amazing. The color contrast between horizon and sea and sea and sand are done beautifully. Details of ropes and the cockpit instruments are precise. While overall the colors are muted, as expected in such a film, they were appropriate and consistent. The 4K version really brings the tiny details into focus, as you would expect from such a quality. Clearly, in a movie that doesn't focus on the characters, but rather makes the setting the main character of the film, those details are what makes the film successful and provide such an immersive experience to watch. There are two important features of Dunkirk. One is the video, which is discussed above and the second is the audio. The audio is presented in DTS-HD, which supports the sound effects and background music perfectly. The whirring of the bombs and bullets flying is precise and clear. Waves lapping at the surf on the beach are so crisp that the lack of music or other noises makes that sound so impactful that you understand the isolation of the soldiers. In contrast, silence is golden and Dunkirk is a prime example as to how the best audio quality presented can even make the anticipated silence that much better. The 4K Ultra HD version also comes with an HD Blu-ray that contains just the movie, a Digital code so you can take the film with you anyplace, as well as a Bonus Blu-ray housing the special features. This is unique to Warner Bros. as usually the special features are contained on the 1080p Blu-ray. Bonus features are broken down into the same sub-parts as the movie subtitles were and focus on the making of the movie and the creation behind the film, rather than interviews with the cast about their roles since previously mentioned, there were no real backstories on the characters. Nonetheless, the bonus features seemed to have meant as much to Director Christopher Nolan (Inception) in the Blu-ray presentation as the quality of these bonus features is impeccable and actually, time-wise, exceed the actual length of the full feature film. Bonus features are as follows, with each section containing several featurettes: Creation (Revisiting the Miracle, Dunkurque, Expanding the Frame, The In Camera Approach); Land (Rebuilding the Mole, The Army on the Beach, Uniform Approach); Air (Taking to the Air, Inside the Cockpit); Sea (Assembling the Naval Fleet, Launching the Moonstone, Taking to the Sea, Sinking the Ships, The Little Ships); Conclusion (Turning Up the Tension, The Dunkirk Spirit). In addition, there is a Coast Guard Promo featuring the US Coast Guard. Dunkirk is a great cinematographic film. The impact of the actual historical event at Dunkirk is finely produced and theatrically impactful. Instead of focusing on a few characters as so many World War II movies do, Nolan took Dunkirk to a new level, emphasizing the actions of many over the actions of a few. Well played, Director Nolan, well played. 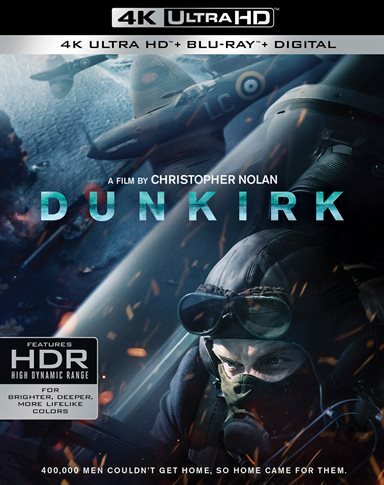 Download Dunkirk from the iTunes Store in Digial HD. For more information about Dunkirk visit the FlickDirect Movie Database.